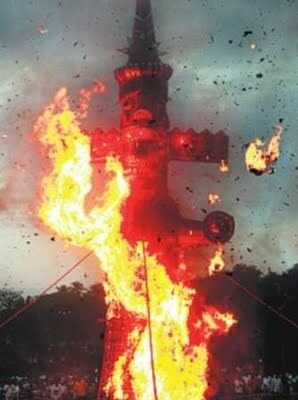 Dussehra symbolizes the victory of good over evil. Dussehra is regarded one of the most significant and important Hindu festivals, celebrated across the nation with much fervor and gaiety. The festival marks the victory of Lord Ram over demon king Ravana, which means the victory of good over evil, light over darkness. 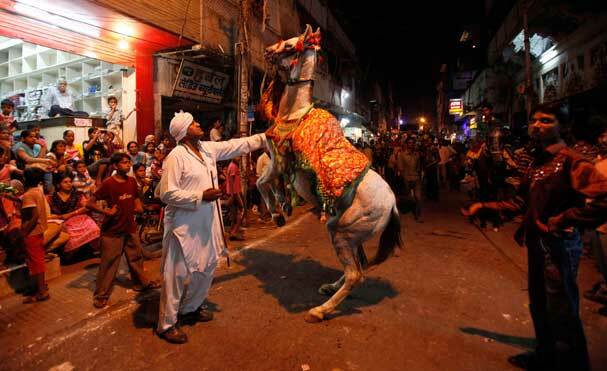 Beautifully decorated tableaux and processions depicting various episodes from Ram's life are taken out on the streets. 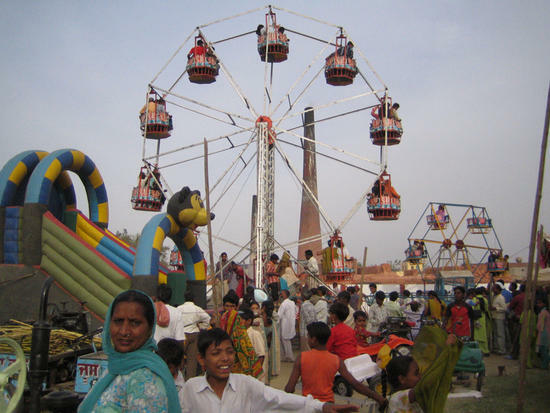 The tenth day or the Vijayadasami, is considered to a very important day. 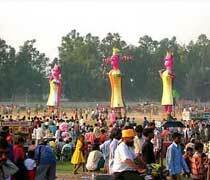 Effigies of Ravana in Lanka ka maidan , his brother Kumbhkarna and son Meghnad are burnt in open spaces. 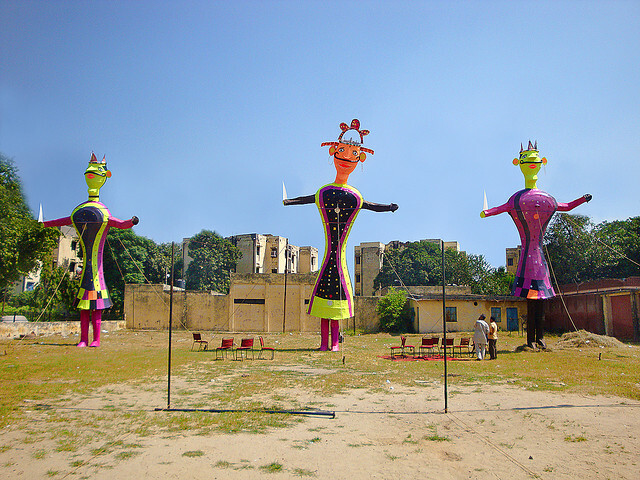 Actors dressed as Ram, his wife Sita and brother Lakshman arrive and shoot arrows of fire at these effigies, which are stuffed with firecrackers. As a part of the celebration Ram Lila (drama depicting the episodes from the lives of Ram, Sita and Lakshman) are staged in different regions of the country. 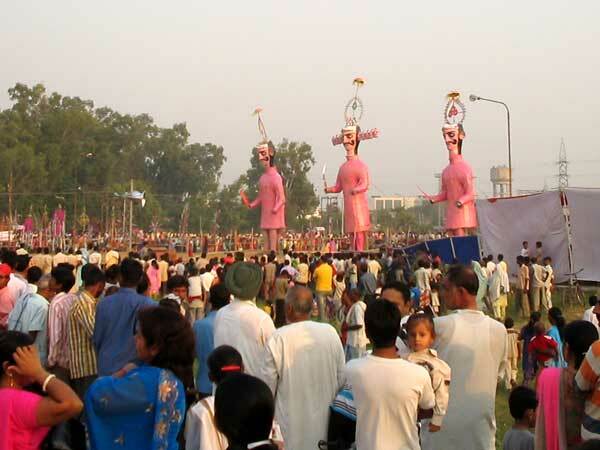 There are various legends associated with the festival of Dussehra. 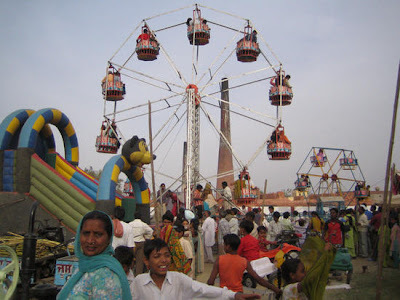 As we have seen in all of the festivals the roots of origin of the festivals can be traced in the Hindu mythology. According to legends Lord Rama, killed the great demon and king of Lanka, Ravana, who had abducted Ram's wife Sita. Ram, along, with his brother Lakshman, follower Hanuman, and an army of monkeys fought a great battle for ten days to rescue his wife Sita. This victory of Rama is regarded as the victory of good over evil and light over darkness. That's why to commemorate that victory of Lord Ram it is celebrated. Every festival in India is associated with certain rituals and customs. 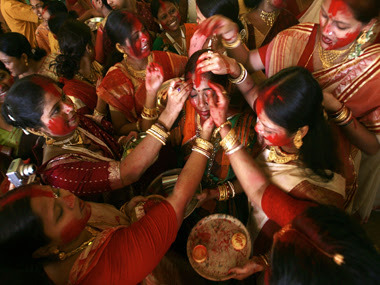 And these rituals are according to that particular region where the festival is originated. Though there are certain festival, which are celebrated across the country in that case every region celebrates it according to their culture and traditions. Dugra puja is one such festival, which is mostly celebrated in West Bengal but other parts of the country celebrates it as Dussehra. 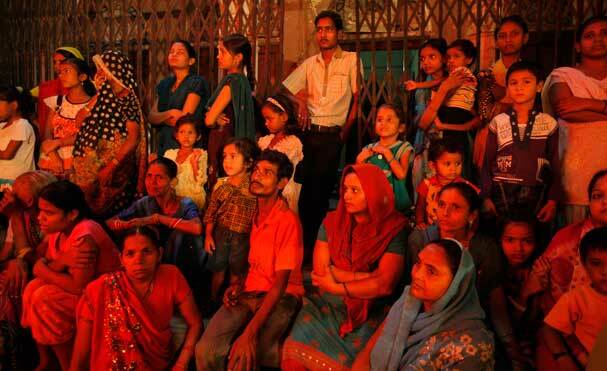 Durga Puja is not only celebrated in West Bengal but also among the Bengalis all around the world. It is celebrated for a period of five days but the most important are the four days of the festival. Starting from Mahasaptami, Mahaashtami, Mahanavami and Bijoyadashami. Which is the seventh, eighth, ninth and the tenth day of the festival. From the morning of Saptmi (the seventh day) the puja starts. A banana tree is dressed in a yellow silk cloth with a red border, which is carried by the priest in a grand procession to the to the Ganges accompanied by the drummers to welcome the Goddess after the bath she is taken to the Puja pandal and kept beside the idol of Lord Ganesha (the God of Good fortune). The next day or Ashtami is considered to be the most important day, as it is believed that Goddess Durga killed demon Mahishasura on this day. 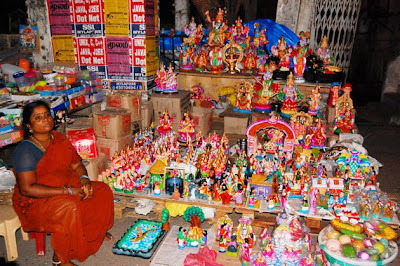 The ninth day of the festival, Mahanavami is characterized by the all-day 'pujas' and 'shaloka-recitals' and a 'Arti' that is considered a formal end of religious customs. 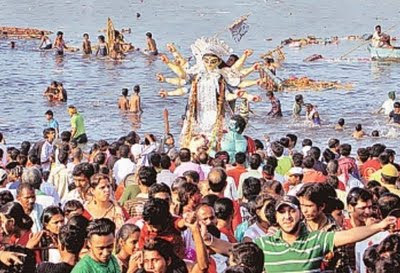 Since it is the last day before immersion of the idols so people are sad as it marks the end of the glorious festival. Cultural programmes such as music and dance fill the rest of the day. The tenth day, Dashami marks the end of the festival with grand processions taken out on streets full of colors and dance, where the Durga idols are taken for 'visarjan' (immersion in a pond, river or sea). 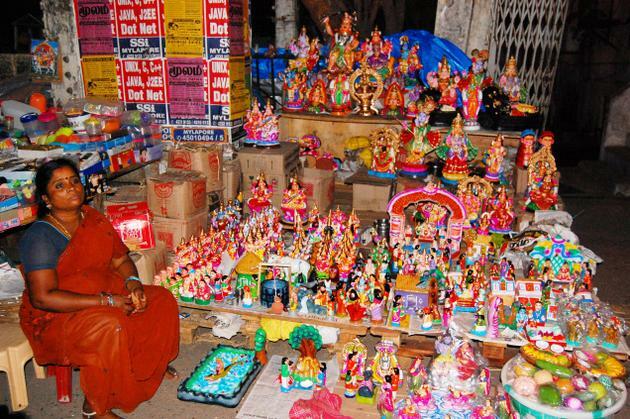 According to rituals idols are immersed in Ganges. Since Ganges is regarded as a holy river. Dussehra is also associated with the harvest festival of the agrarian societies and is believed to be the beginning of New Year in some communities.